Contrary to popular belief, there can be structure to the process of starting a company. This is one such structure. Sometimes people say, "Wow - starting a company: that's so unstructured! That's so hard. You have to make it up as you go along. It's not like consulting, or any other job, where there is a clear route". In my opinion this is a mis-perception. A good starting point to rectifying this mis-perception is the structure provided by Steve Blank's book, The 4 Steps to Epiphany. Starting a company is not any more or less structured than becoming a partner at top consulting firm, CEO of a consumer goods company or MD of a trading desk at an investment bank. Are the paths to any of these goals clear? Kellogg, and I'm sure other business schools also, provide some of the tools to get these. However, the trick is probably in sowing these up into a plan to get there - a structure. What do I need to know? What skills do I need? Where do I need to be? If there is one lesson that one tends to learn over and over again in life and business school, it is that "failing to plan is planning to fail". Creating a plan ensures you've thought through a number of issues and at least mitigated some of the risks. It provides a route to get from A to B. In the realm of startups, a business plan is a kind of plan for starting a business. However, it usually describes the destination - point B - of what the business will look like, rather than actually describe how to get there. How do you get to point B? It transpires that there are entrepreneurs who are systematically more successful than others. What is it that they know that others don't? What are they doing differently? From what I know of the start-up space, Steve Blank's The 4 Steps to Epiphany is the clearest codification of what successful entrepreneurs do right. It is dry book, written very much like a technical manual. However, it provides a real structure to starting a company. Customer discover: Develop hypotheses for the problem you are trying to solve and test them against real potential customers. Customer validation: Get a sales person, sell to initial customers, verify business model. 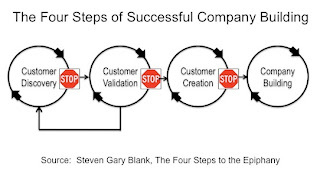 Customer creation: Establish a repeatable process for creating demand for and selling the product. Company building: Attain mainstream customers, build functional departments. My journey to date has centered around the first two phases of the process. I've gotten to know and understand some of the concepts from these parts of the process. For example, Blank repeatedly insists on the need to "get out of the building" and talk to potential customers. My posts from the early part of my 13 week Summer provide some insight as how the plans for my business changed as a result of this. Perhaps more subtle is his advice to "find customers for the product you're already building". If you listen too much to customers, you change your requirements so frequently that it becomes impossible to building a finished product. Blank provides a sample, a great blog I should read more of and others have now even started rewriting the parts of the book so it's a little more digestible. Thanks for sharing your thoughts on this pertinent topic. "Four steps to epiphany is a brilliant book" and reading Steve Blank is always a pleasure. A couple of key things we are being taught is to find customer segments beyond our initial hypotheses and to try to sell the customer in such a way that he puts up cash upfront which then becomes your seed money to work with. Starting a company definitely is a process. Thanks for sharing your thoughts.